A perfect fit: ATA and Hard Edge to engage young drivers with road safety. We're proud to announce that The Australian Trucking Association (ATA) has chosen to partner with Hard Edge to engage young drivers with the road safety messages of the Volvo ATA Safety Truck. The Volvo ATA Safety Truck ‘experience’ will be updated with new messaging, branding and experiential ideas to ensure the travelling road safety exhibition connects with its young audience. And a targeted campaign will build awareness and a community around the truck and the road safety issues it combats. The ATA is the peak body representing truck operators in Australia. They chose Hard Edge to work on the Safety Truck update following a selection process. “Our current Safety Truck design has connected with the trucking industry and broader community since 2013, but it’s time for a change,” ATA CEO Ben Maguire said. “16 to 25 year old drivers and vulnerable road users are over-represented in the crash statistics, so we plan to target these drivers, riders and pedestrians with an attractive and evidence-based exhibition and campaign. “The ATA was a partner on the 2018 Re:act road safety behaviour change program founded and run by Hard Edge. Re:act was a chance for us to gain insights into possible future directions for the Safety Truck and ensure this great resource is as effective as possible in educating young people about how to share the road safely with trucks. Hard Edge Managing Director Andrew Hardwick said the Volvo ATA Safety Truck campaign and re-design was a perfect fit for the independent agency, reflecting its passion for making a positive social contribution and expertise in behaviour change. The Volvo ATA Safety Truck, sponsored by Volvo, BP and NTI, educates the public on how to share the road safely with trucks and has been delivering safety exhibitions in the custom-built trailer since 2008, travelling 60,000km and reaching 33,000 people annually via truck shows, festivals and school visits. Follow the links for more information on the Volvo ATA Safety Truck, Hard Edge or the Re:act behaviour change program. For more information please contact Andrew Hardwick on 0417 334 399 or ahardwick@hardedge.com.au. All of us at Hard Edge have been inspired to focus our future on helping brands and organisations make the world a better place through thinking and creative that shifts behaviour and positively impacts society. If that sounds like you, we'd love to help. Want to chat? Email or call us on +61 3 9245 9245. Design students inspire at Hard Edge with trucking fantastic road safety concepts. April is always an exciting month on the Hard Edge calendar as another throng of Swinburne University of Technology communication design students descend on the agency to pitch their responses to the annual Re:act brief. For the uninitiated, Re:act is a project where we give a real world campaign brief around a social issue to third year design students and challenge them to raise awareness and change behaviour among the 18-25 year old audience. We’ve been running Re:act for three years in collaboration with Swinburne and with the support of a great group of industry partners who share our passion for road safety: the TAC, RACV, Melbourne Metro Rail Authority, Transurban, the Australian Trucking Association, the National Road Safety Partnership Program and ARRB Group. Every year we’re mightily impressed by the strategic thinking, creativity and professionalism of the students’ pitches. And what we saw earlier this week was no different – maybe even the best yet. This year’s Re:act brief focused on the safe interaction of 18-25 year old road users with trucks. With the number of trucks on our roads growing and major infrastructure projects like the Melbourne Metro Tunnel increasingly bringing heavy vehicles into our cities, we’ll all be interacting with trucks a lot more – whether in the car, on foot or on bike. The brief asked students to develop a campaign to educate the target audience on the risks of sharing the road with trucks and to positively influence their behaviour to reduce crashes and ‘near misses’ with trucks. After an initial briefing and Q&A, 10 groups of students developed and then pitched their campaigns to us at Hard Edge and our industry partners. With an impressive range of concepts from all groups, choosing our finalists was no easy task. Meg Danaher, Ken Smith and Karl Rombauts highlighted the power of humour in achieving cut through and engagement with the target audience with their “Size Matters” campaign. Aside from presenting a great cheeky concept, the standard of design work, strategic thinking and the breadth and quality of activation ideas the team produced was seriously impressive. Remember their names – Meg, Ken and Karl – these guys are going places. This year’s winning pitch drew on audience insights to deliver a hard-hitting call to action to 18-25 year old road users. 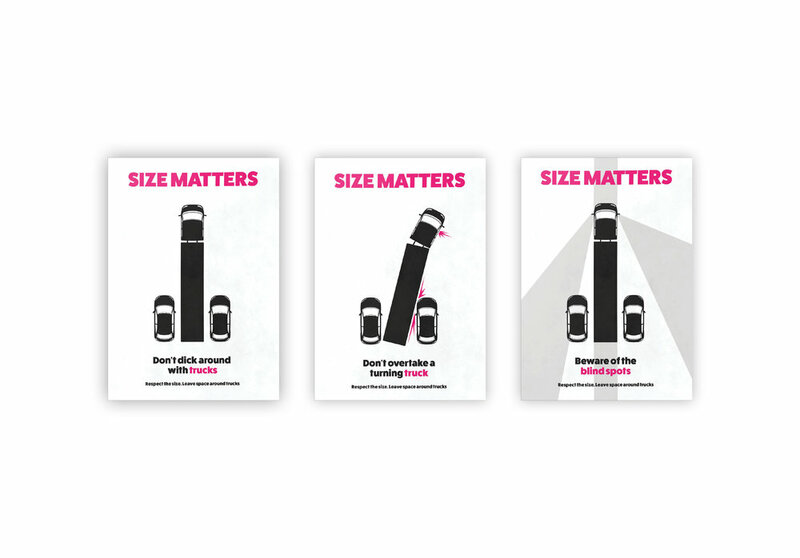 Caitlin Preyser, Charlotte Hicks and Grace Kirby created a bold typographic visual concept, with a range of creative executions to communicate the risks of sharing the road with trucks and provide clear advice on how to stay safe around them. It was pretty trucking good. Congratulations Caitlin, Charlotte and Grace. These are just two examples of the 10 great campaigns that were presented at Re:act 2018. Hats off and big props to all the students involved. It’s safe to say the future of our creative industry is in safe and very talented hands. Want to know more? Check out our development of the Re:act branding. Hard Edge is a tight team of strategic thinkers, creatives and doers. We help brands discover their value and find their voice. Want to chat? Email or call us on +61 3 9245 9245. He has been dubbed the ‘Doughnut Prince of Melbourne’, and at the age of 16 has already been in business for two years. Morgan Hipworth started his business, Bistro Morgan, at the age of 14, balancing school books with doughnut cooks. The business name derived from when Morgan, from the age of seven, would cook his parents a 3-course meal — they would call it Bistro Morgan. 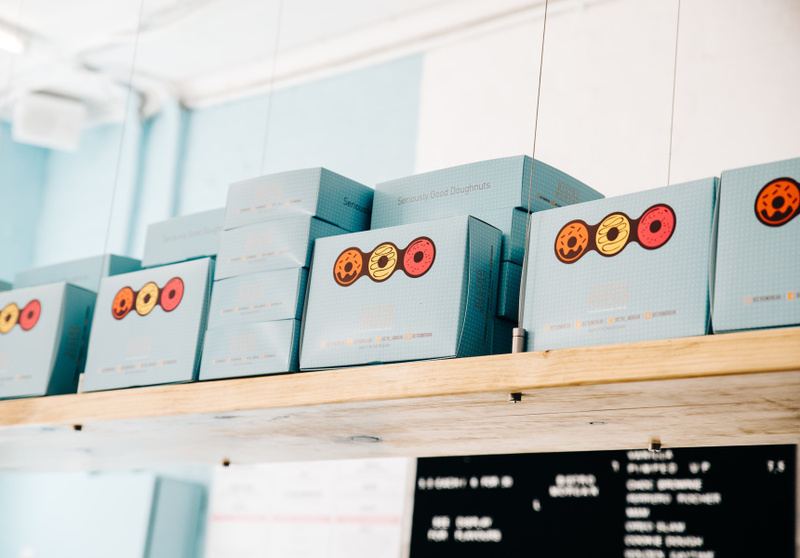 Morgan began supplying cafes around Melbourne before opening a pop-up store that sold 10,000 doughnuts and then, in 2015, Morgan opened up ‘bricks and mortar’ in Windsor — all while juggling full-time school work. This amazing young person is filled with ambition and passion for what he does, not to mention sheer commitment to achieving his dreams. A key element of his success is social media, with apps like Instagram making a significant contribution to his achievements (and reputation). These delicious doughnuts are perfect eye-candy to be shared and spoken about. It’s a social media gold mine with Bistro Morgan’s Instagram page having 54.5K followers, and growing. This hype has taken young Morgan on a media journey, appearing in everything from Broadsheet and Vice to the widely-read Herald Sun, just to name a few. The technical term for this is earned media; the result is thousands of dollars’ worth of free advertising. 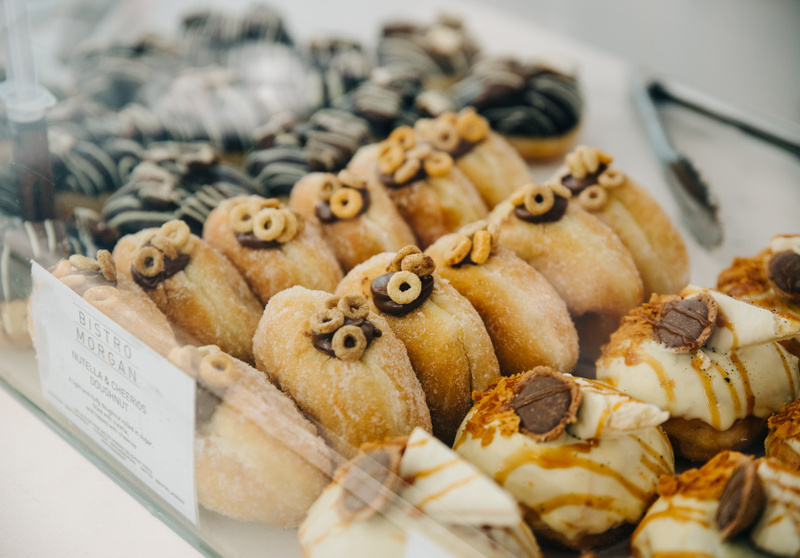 Morgan’s doughnuts have the power to cause serious ‘FOMO’, with thousands of posts being shared across Instagram and other social platforms. If brands can crack into this platform by posting sharable content, it can only be beneficial. This communal Instagram experience is a key strategy in creating hype behind a brand, particularly one centred around food. People will go out of their way to experience something they have seen their friends and followers doing. Smart phones have made it incredibly easy to document our every move on social media. We are part of an ever-open and always-connected society where we share who we meet, the food we eat and the things we do on the weekend. This has become common practice and Bistro Morgan’s doughnuts are a prime example, creating the perfect ‘Instagram-able moment’. This is something just about every businesses strives for — genuine recognition from genuine customers. Having authentic brand communication generated by the customer is the new way to be recognised. 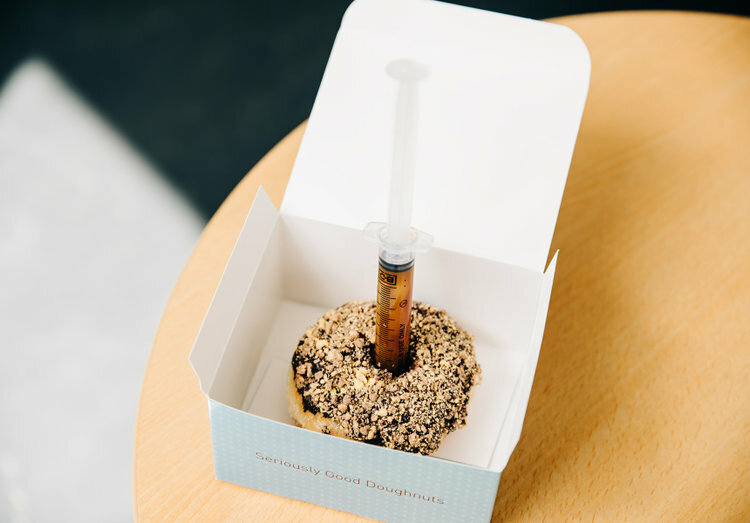 Anyone fancy joining me for a Salted Caramel Tim Tam Syringe Doughnut? I’ll meet you there. Hard Edge is a strategic marketing and creative agency for disruptive brands. To learn more email or call us on +61 3 9245 9245. Pumping music, staff dancing behind the counter and the Messina experience we all live for. When it comes to major players disrupting the ‘cool food brand’ category, Gelato Messina hasn’t just flaunted the rules, it’s rewritten them. Declan Lee, co-founder of the infamous Gelato Messina, recently revealed that the business is based around one value, ‘honesty’. 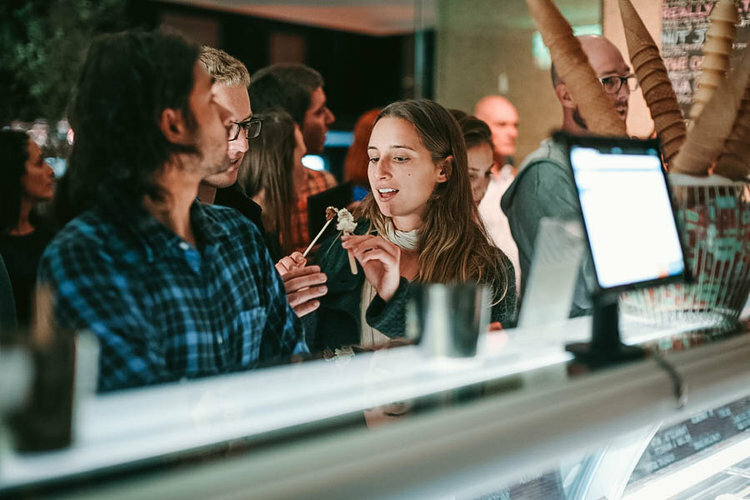 Not only is the superb ice-cream honest – it’s made from scratch, yep all 40 flavours – but the simple value of honesty plays a big role in staff culture, which is reinforced by the Messina customer experience. Since 2006, the franchise has grown to 17 stores across the east coast and in Vegas, baby. Way back in 2008 it had the opportunity to use social media, before others were doing it with food. This is one example of how being disruptive in the early days helped build the business to where it is today. Gelato Messina had an early opportunity to build communities through social media, and did just that. But what is it about Messina that keeps us wanting more? It didn’t run with the traditional bright light-based ice-cream store fitout. Instead, Gelato Messina was bold and believed if the lighting was right and the mood was right, the business would attract everyone. The (house) music was inspired by Declan’s DJ background. The owners wanted Messina to feel a bit like a party, not over the top but fun. Basically, an ice-cream nightclub. 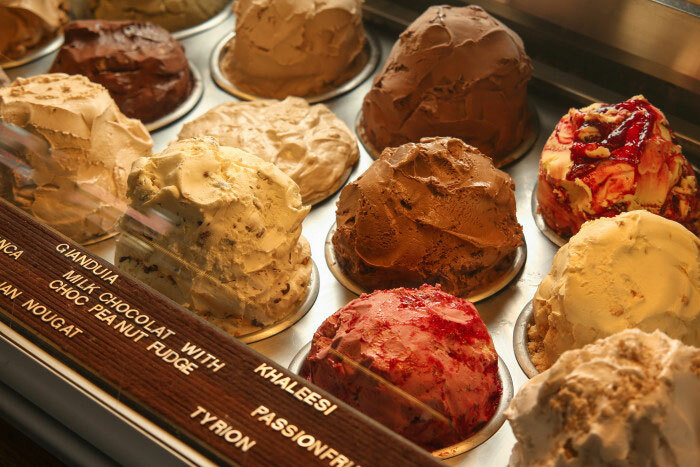 Gelato Messina claims to make its ice-cream like no other in the world and goes to great lengths to make its product. It has 40 flavours and everything is made from scratch except two biscuits, which the company says it can't make better. Honesty at its best. Messina Snapchat takeover. Say what? I guess when your core value is honesty, anything and everything is a possibility. Each store manager takes it in turns to document their weekend outside of work. It also shows off their personalities and is a great way to share with their audience. They are free to post what they want, just don’t be offensive or silly. Messina doesn’t believe in made-up content. Back to honesty. It’s also employed a photographer and videographer to document the Messina Gelato process to create empathetic storytelling about the brand. Some may say doing slightly odd things like collaborating with a commercial brand such as Tim Tams was a risk, but producing four limited edition biscuit flavours was nothing if not disruptive. Did Messina sell out? Marketing genius if you ask me. Although Messina already had the street cred, the collab definitely helped Messina’s brand awareness and a commercial giant was able to play with the cool cats for once, so a win-win for both. In 2015, Uber partnered with Messina to deliver free ice-cream as an incentive to sign up an Uber account. This was a very clever approach from both brands. Who says ‘no’ to free ice-cream? In the past, the fastest way to transact in an ice-cream shop was with old fashioned cash. Yes cash money. But as technology is developing at a rapid rate, Gelato Messina has created a super easy smartphone app that allows customers to pay with their phone, earn points and redeem exclusive member deals. Garlic and vanilla gelato anyone? This concept is where eight customers are invited to a Sydney or Melbourne store to try a seven course degustation menu. This is how Gelato Messina challenges itself to make sure it’s continuing to push the boundaries on how certain products fit together. This is a true indication of what passion looks like in the cool food industry. Would Messina be where it is today without its disruptive marketing approach? If you haven’t yet had the Messina Gelato experience, stop what you are doing right now and head down to your nearest store. And let us know what you thought (and which flavour you had).